Time to start the discussion of our next novel from The Bestseller Code 100 list, The Cuckoo’s Calling by Robert Galbraith. Robert Galbraith is a pseudonym used by J. K. Rowling, author of the Harry Potter series. She also wrote The Casual Vacancy, another title on The Bestseller Code list. This makes J.K. Rowling the only author with two novels in our best of the bestsellers challenge. Summary: When a supermodel falls to her death, her brother doesn’t believe that it is suicide. He hires private investigator Cormoran Strike to find out the truth. This is the first in a series. The Silkworm is the second novel and Career of Evil is the third novel in the series. 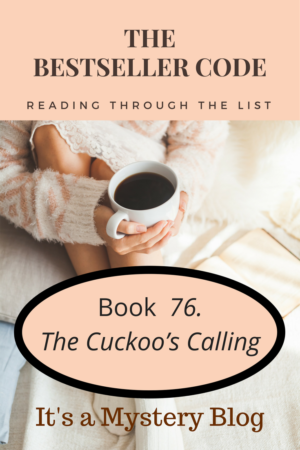 Have you read The Cuckoo’s Calling by Robert Galbraith? We’d love to hear your thoughts. Have you written about The Cuckoo’s Calling by Robert Galbraith? Feel free to add a link to your review here.